Ram Charan Teja and Upasana Kamineni got married early in the morning today at Upasana's farmhouse in Hyderabad. The couple had got engaged in a glitzy ceremony in December last year and will be taking a four-day break to go on their honeymoon. 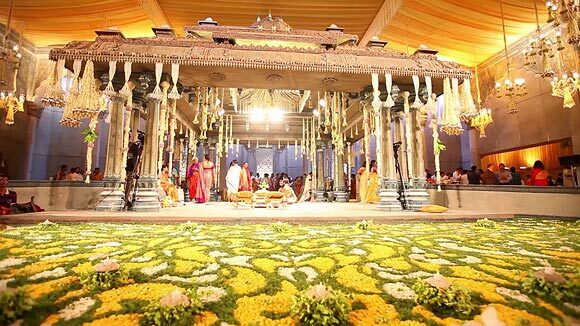 The mandap where Ram Charan Teja and Upasana got married was adorned with exotic and fragrant flowers. The ceremony was attended by the who's who of the film industry and politics from Andhar Pradesh, Tamil Nadu and Mumbai. The bride arrives at the venue. Ram Charan Teja was escorted by father Chiranjeevi to the venue. 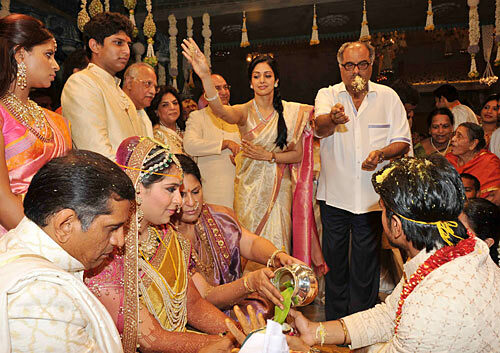 Actress Sridevi blesses the young couple along with husband Boney Kapoor. Upasana sits pretty in the mandap, dressed in her bridal finery. Ram Charan Teja's mother Surekha ties a thread on his forhead as part of a ritual. The bride and groom come face to face for the ceremony to begin. 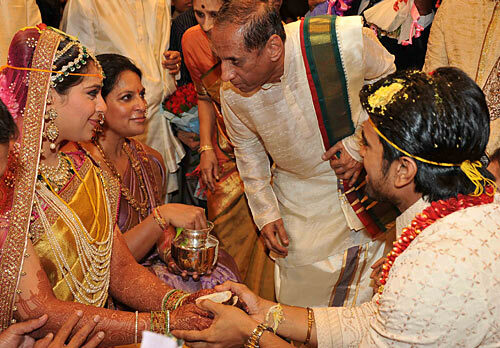 Ram Charan Teja ties thali (sounth Indian mangalsutra) around Upasana's neck. Another ritual where rice is thrown over the heads of bride and the groom. Allu Arjun, Ram Charan Teja's cousin, entertains guests. The happy couple walks away after the ceremony concludes. Anil Kamineni, Ram Charan Teja, Upasana, Surekha and Chiranjeevi pose for a family snap after the rituals. Ram Charan's mother Surekha applies tika on Upasana's mother Shobhana's forehead. The mandap where the ceremony took place was adorned with fragrant flowers. 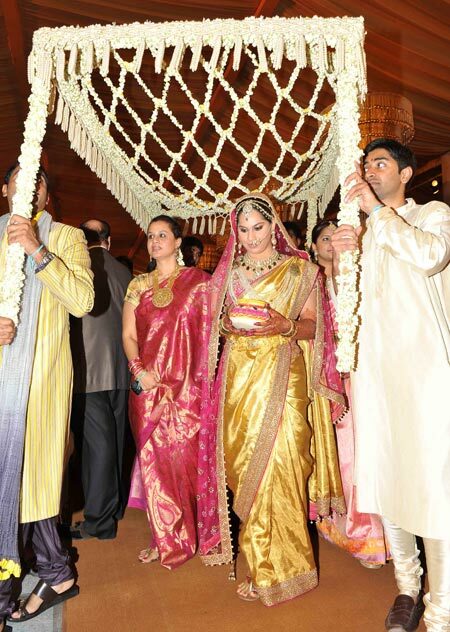 Shobhana Kamineni performs a ritual as the new couple looks on.